The Socorro Gun Club hosts a few shooting events where youth can learn safe firearms handling and competitive marksmanship skills. 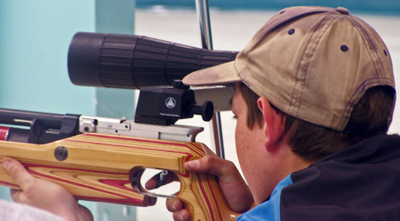 The weekly air rifle practice is suitable for youth from elementary ages upwards. Rifles, ammo, targets, and safe instruction are provided free of charge by the New Mexico Tech Shooting Sports Club and the Socorro Gun Club. Civilian Marksmanship Program Schools are held throughout the summer months at the SGC range. Rifles and 50 rounds of ammo are provided for $5.00 to juniors. See the description on the shooting page. Attendance at one air rifle practice is required before participating in a CMP school.